There are lots of perks to working at a craft brewery. Your friends are mostly envious. You dress how you like. Every day is ‘Bring Your Dog to Work’ day. And oh yeah — free beer. Perhaps the greatest perks is are not quite so obvious, but just as important. The opportunity to work around like-minded people. The opportunity to support those whose passion creates an incredibly inspiring work community. And, every now and then, the opportunity to try a really good pickle. It might not be the first thing that comes to mind when you think of quality North Carolina products. Beau Martin is hoping to change that. Beau is in to pickles. Like, REALLY into pickles. Ever since he replicated his grandad’s pickled green tomatoes when he was a teenager, Beau dreamed of having his own pickle business. A couple of years ago, after a decade of restaurant work, he figured it was time. And Green River Picklers was born. Fast forward to a recent camping trip — Beau ran across a fellow camper who was part of Appalachian State’s Brewing Sciences program. The tasting marathon that ensued gave birth to an offbeat notion . . . Brews n’ Brines, an event pairing the best of two worlds — craft beer and craft pickles. I can feel you out there, chortling as you sit at your computer. Trust me, I was no different when they approached us about pairing some of our beers with some of their pickles. 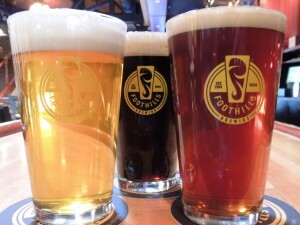 Then they came by the brewpub, and we sat around tasting them with different beers (I know, tough job). You cannot believe how good these two products taste together. You will, however, get a chance to find out . 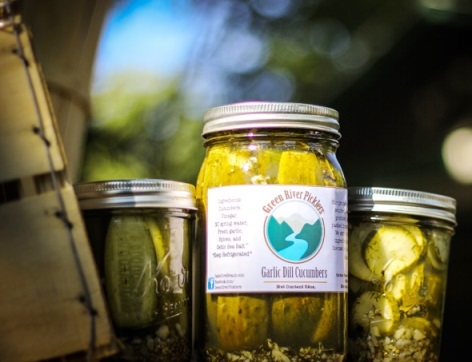 . . Green River Picklers will be at our brewpub Wednesday July 16th, 7-11pm, for a Brews n’ Brines event — 4 beers and 4 pickles for $10. Come get pickled with us! Find the full list of Green River products here. They are nutrient dense, vegan, and gluten-free, and brined in organic vinegar. Categories: beer, brewery, craft beer, environment, homebrewing, north carolina craft beer | Tags: beer, brewery, community, craft beer, craft brewery, drink local, homebrewing, local sourcing, North Carolina craft beer, pickles | Permalink.